Fast forward to the preliminaries and race day. When I was tired from those races I thought back to a chapel talk at Groton from someone who was good at crew and gave a chapel talk about going to some camp where all they did was row. I was an underclassman and the Adrian Martin, the person giving the talk was a senior I think. His talk was like any other I suppose. But I really didn't understand his enthusiasm... until we did the preliminary races and of course... the races themselves. Irene Chu, our coach, was very encouraging and believed in us and pulled us together. But it was my Crew Coaches words that echoed in my ears during the race. He was talking to some of the members of the lower boats were lazy. Now... to be lazy and be on a dragon boat... that is one thing. People come from all types of backgrounds.... but on a high school crew team the feeling is different. "Some of you aren't trying your hardest, you'll see in the higher boats, boys and girls, that after a race, they can't really talk about it." Maybe I didn't put full effort into crew, in that I never went to pre-season didn't go to Henley (just to support the team I wasn't good enough to row at that level) and I didn't continue the next season. I switched sports. But some of the excuses were that I was a poor kid from housing projects in a single parent household and my mother was battling all kinds of cancer one of which would take her life a few years later. I didn't have time for to embrace this preppy Groton stuff I was just doing cause I had too, though I did try my hardest. But paddling on race day, I thought of Adrian Martin, and Coach Niles, and Andrius our steerer who said, "If you are yelling you aren't paddling hard enough." And I thought of Coach Irene when she showed us the proper technique to use your legs and the rotation of your waste the same way you do for white crane Kung Fu actually, but with 6 practices I hadn't quite gotten it yet. I thought of all those things and paddled like a mother****** right through the wave that hit the boat when a speed boat zoomed by. I was tired but I kept pushing. 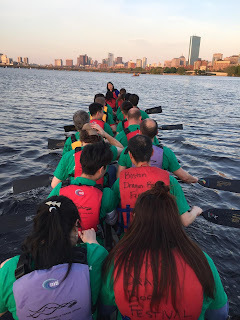 It was the culmination of team work and 6 fun adventurous practices on the water, some of which were rainy and it felt like we were on some Viking Dragon boat preparing for a raid. I felt like I was given a second chance I guess.... and we won! Going from tent to tent and seeing so many familiar Chinatown faces... it was really a lot of fun and I understood other people's love of this sport. CYPN Storm (which I believe is the team pictured in the first photo, was actually the team that won the whole tournament outright, and happens to be coached by the brother of our Coach. Watching the awards ceremony with my son sleeping in my lap, on a nice sunny day by the Charles I thought about how positive the whole thing was and how great Chinese Americans (and all their friends... but there is no question that the sport is still a Chinese one) looked so cool as a group here. 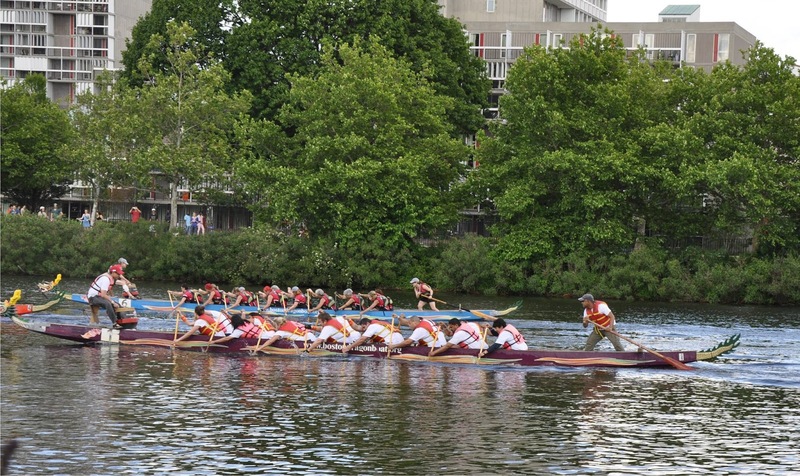 Every stereotype of Long Duk Dong or Fu Manchu was total blown out of the water not only by very athletic paddlers, but all the other ethnic groups and races participating in the festival perfectly willing to follow commands like, "Weigh enough!" or "Sit Ready!" or "Hold water!" when called out by an Asian American. Something which I wouldn't say was impossible at Groton. There were Asian Americans who were very athletic and did crew and Asian American Coxswain's as well. 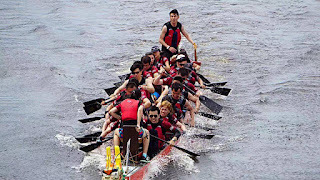 But in Dragon Boat, the Asians are running the show... and big corporations sponsor boats to paddle and actively support and participate in the festival . To use my boat as an example... we were all taking orders from Coach Irene, an Asian woman... and enjoying it. It was also an opportunity for me to bond with a lot of people I knew who had done Dragon Boat before through their company or a club. Now, although I have a lot of friends who do lion dance and Kung Fu... it seems like Dragon Boat has made it further into the mainstream. Their is less mysticism and it's simply easier to understand. Many cultures have boats, and a race is very easy to understand. Also, the fact that we were able to race after just 6 practices is amazing. It made me think, "Is lion dance and Kung Fu really that hard? Can't it be simplified down as well? 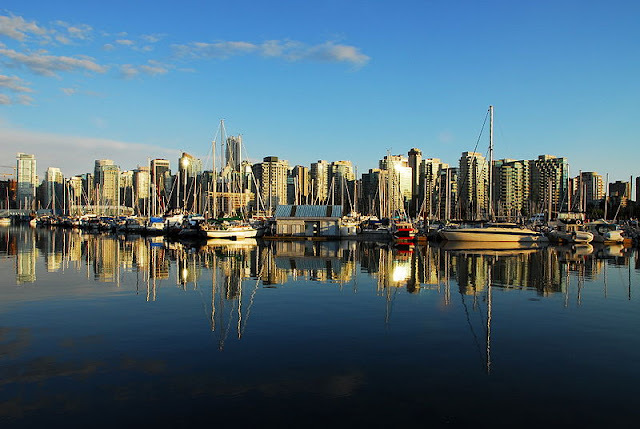 After all, there is a lot more to Dragon Boat I haven't uncovered yet too." I mean there were 75 teams from all over n Boston this year. Teams that PAY to participate. Think about that in terms of Lion Dance and Kung Fu. 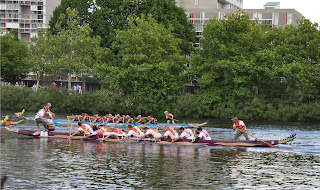 And furthermore you need 22 people to paddle, a skilled steersperson and a drummer. A skeleton crew for lion dance (traditionally) is 5. But if you modernized and added music it's two... but then that defeats the whole "work as a team" aspect that is so appealing about Dragon Boat. I mean imagine an event with 75 Lion dance teams. If Kung Fu and Lion Dance can culturally move toward what Dragon Boat has developed into in this country I think it would be a good thing. The types of teams were very telling. Charlestown High, various Chinatown non profits, banks, corporations.... but also alumni Associations of Chinese American schools and even Chinese Schools. Colleges in Beijing who happen to have enough people in the Boston area that they can form a few boats and race. Let's put it this way... of all the things I have to cover on this blog... this restaurant closing, this block being sold.....this festival definitely shows how far Chinese American culture has come. It was a breath of fresh air... or rather, a splash of cold water to the face.